Harper Cancer Research Institute Director Sharon Stack met last summer with Congressional staffers in Washington D.C. to advocate for cancer research. Last week, it was Reggie Hill’s turn. 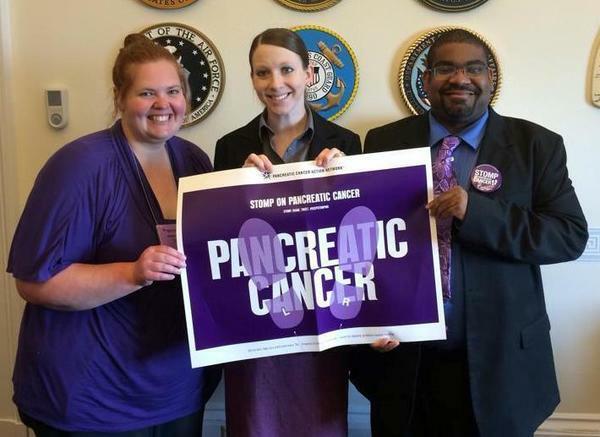 Hill, the Archibald Assistant Professor of Cancer Biology at the University of Notre Dame, was one of 450 campaigners who visited Congress on Wednesday to advocate for federal pancreatic cancer research funding as part of the eighth annual Pancreatic Cancer Advocacy Day. 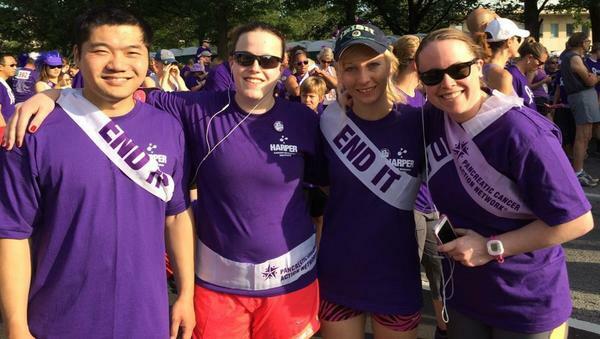 The event is organized by PANCAN, a nationwide network for advancing pancreatic cancer research. Hill met with staffs of seven legislators, including, Sen. Ron Wyden (D-OR), Sen. Tammy Baldwin (D-WI), and Sen. Johnny Isakson (R-GA). Hill also met with the staff of Sen. Joe Donnelly (D-IN), a 1977 graduate of Notre Dame and a 1981 graduate of Notre Dame Law School. 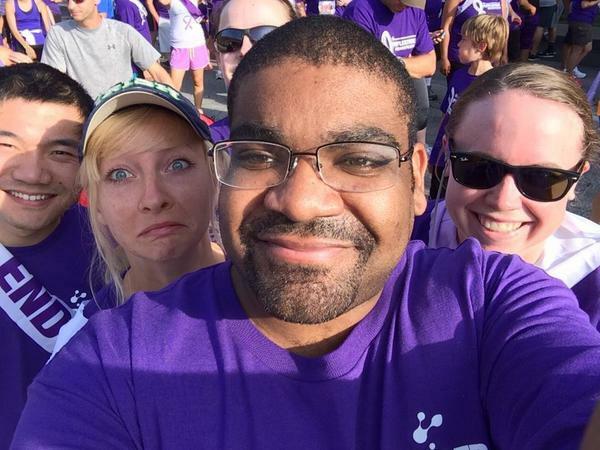 Hill’s advocacy blitz continued on Saturday, when he and members of his lab team participated in the Purple Stride 5k in Indianapolis. Hill said the fundraiser, part of a nationwide series of race/walk events paired with Advocacy Day, had raised at least $110,000 by the start of the race. Hill’s meetings centered on four PANCAN priorities. Chief among them are securing government allocation of $5.26 billion for the National Cancer Institute and sustaining pancreatic research funding for the Department of Defense’s Peer-Reviewed Cancer Research Program, he said. Dr. Lynn Matrisian, a PANCAN vice president and a member of the Harper Institute’s external advisory board, invited Hill to attend Advocacy Day. Hill, one of 17 pancreatic cancer researchers who participated in Advocacy Day, said he felt he offered a unique perspective on the importance of pancreatic cancer research funding. At the Harper Institute, Hill is developing animal models that more accurately represent pancreatic cancer in humans, a crucial step in improving scientific understanding of the disease. Ultimately, Hill’s research could help the scientific community address key challenges in pancreatic cancer research, like early disease detection and chemo resistance. In addition to his meetings with legislators, Hill met with Julie Fleshman, the president and CEO of PANCAN, and Laurie MacCaskill, the chair of PANCAN’s board of directors and an eight-year pancreatic cancer survivor, to discuss the Harper Institute’s research goals and Hill’s pancreatic cancer research progress. Originally published by Michael Rodio at harpercancer.nd.edu on June 23, 2014.